Our pictures of the 2002 FireBlade have got everybody talking… and not everyone has been immediately won over by the new look. In postings in our Talk News bulletin board, peterfoley said: " Deffo don’t like the rear light, looks 60s. " spindizzy said: " The more aggressive styling is welcome. Probably be a major track weapon. " pbhandal said: " The 2002 Blade may grow on me, but at the moment it looks all wrong. " " If you’re listening Honda, please get ride of that crap black coating from the frame, " added adzfireblade. You can see what everyone else is saying about the new Blade, and add your own opinion on the Talk News bulletin board. Follow the link, right, and add to the posting called " 2002 FireBlade " . The updates extend beyond a new headlight – virtually every part has been upgraded or replaced to make the Blade sharper than ever. Although it’s based on the current Blade design, which itself is less than two years old, the new bike has been on the receiving end of some serious development work – extending below the skin to a heavily revised engine and a new chassis. Honda is keeping quiet about the details, but it’s known to have upped the capacity to more than the current 929cc, and since the motor can’t be taken to 1000cc, the final figure is likely to be around 975cc. Honda insiders claim the new bike makes around 10bhp more than the current model. That equates to a true 145bhp at the rear wheel. The exhaust appears to feature a titanium end can, similar to the one used on the Yamaha R1. This should help shave grams off the weight – helping secure the Blade’s title as the lightest of all the open-class superbikes. However, Honda hasn’t left it at that. As well as tuning the motor, it has given the Blade a new frame and bodywork to sharpen both the looks and the handling. Honda has slightly extended the rear section of the frame, though it is still not attached to the swingarm pivot. In line with the CBR600 Sport, the frame gets a coat of matt black paint to give it a racier look. The swingarm itself is totally new, replacing the current beefy box-section arm with a more delicate, braced design. The front suspension appears to be unchanged – not surprising given the Blade’s excellent handling – and the brakes are identical to the 2001 model’s four-pots. But despite all the technical upgrades, it’s the new bike’s styling that will be the deciding factor for many potential buyers. 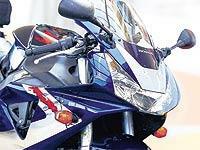 The most striking aspect is the slimline new headlight, which has clear links with the current bike but provides an obviously new and more aggressive face for the Blade. Like the 2001 machine, it uses three lights under a single glass cover, but while the old version didn’t make a big feature of the triple-light design, the new one shouts about it. New ducts hint at a modified ram-air system, which could help boost power further at high speed. The pillion seat appears to be even higher than today’s. The seat’s plastic now runs all the way forward to the frame, disguising the new, lighter subframe beneath. This bike was snapped at a filling station during tests in Germany. When the bike makes its official debut in September, expect to see new graphics and paint to highlight the redesign. What do you think of the new Blade? Follow the link, right, to have your say. Virtually nothing has been carried over unchanged from the current VFR800 to the new 2002 machine.